Strength 1 — Hops & Length: Qualls stands at 6’5” but has a very long wingspan at 6’11”. Add that to his freaking leaping ability and you have a player that can become a hazard on both ends of the floor. On the offensive end, Qualls has a long hang time that allows him to free up in air from his defender. Strength 2 — Rebounds: Qualls is a great rebounder for a player at his position (5.3 per game). With his great leaping ability and freakish wingspan (see above) he is able to separate from his assignment especially on the offensive glass. 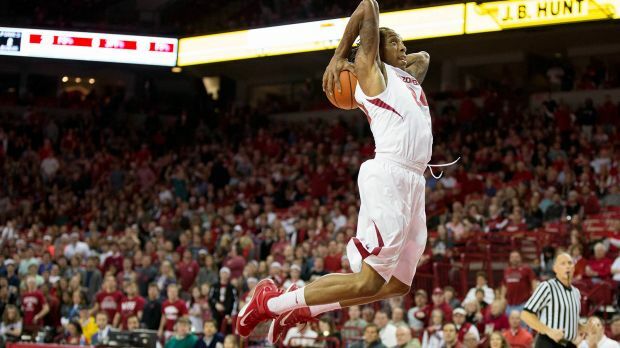 Strength 3 — Progress: As a junior with Arkansas, Qualls averaged 15.9 PPG shooting at 43% from the field. Although 43% is nothing to brag about, Qualls progressively got better each year (.401, .429 and .436). He is a focused mature player who only wants to get better. Very Coachable and willing to learn. Weakness 1 — Forces Shots: Qualls is a player that has never really been able to create his own offense therefore he makes really bad choices with his shot selections. Relies too much on a jump shot that isn’t really there to begin with. Must learn a way to harness the skills that he has instead of forcing the ones that he doesn’t. Weakness 2 — Handles and Footwork: Flat out and to the point, he needs to tighten up his offensive handles and his defensive footwork. If not, a lot of offensive turnovers and a lot of defensive blown assignments. Weakness 3 — Get Better Defensively: Not to call Qualls a bad defender, but his steals (0.9 per game) and blocks (0.5 per game) are very low averages for a wingman. He needs to anticipate better and get his footwork in check. *Injured: Tore his ACL in workouts on 06-11-2015.